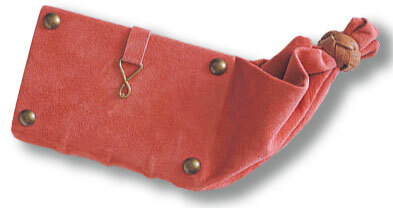 Girdle book, a medieval binding structure featuring a long extension of leather, which could be attached to a traveler's belt. $750. 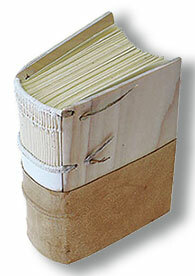 Medieval cut-away binding model, lacing and covering appear in process to reveal how the binding is constructed. $500. Both models include a twelve-page, illustrated booklet with bibliography outlining the construction of medieval bindings in general and the girdle book in particular. Text block size for both models is 4.75" x 3.25" x 1.25".